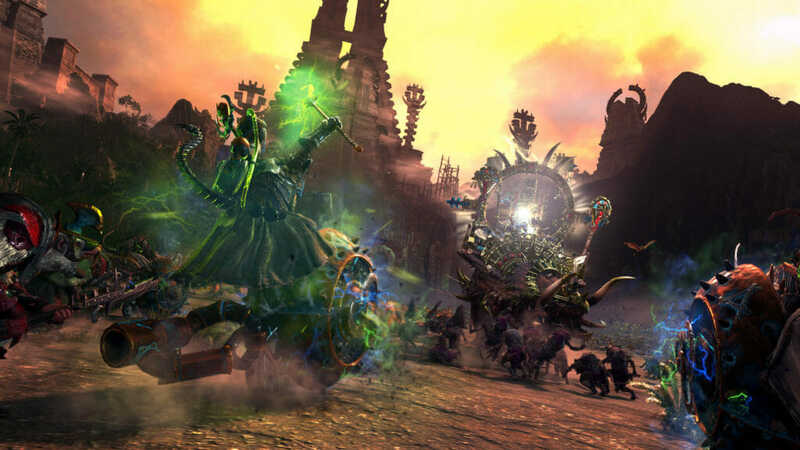 The Laboratory offers a brand new free game mode for Total War: WARHAMMER II, designed in collaboration with Intel®. It introduces a custom battle playground with 16 different sliders to tinker and play with to push your battles to new and ridiculous levels of mayhem. While all players will be able to play in The Laboratory, it is entirely free of any minimum or recommended specification guidance. As a result, sliders that effect GPU or CPU performance can easily override your main performance settings unless you have a very high-powered PC. This can negatively impact your frame rate or likely cause gameplay behaviours you won’t see in the main game. This is intentional and very much the point of The Laboratory! See the trailer, here: https://www.youtube.com/watch?v=qLSezK6_N5w, for more info on what’s possible. When can I play with The Laboratory? Do I have to pay? 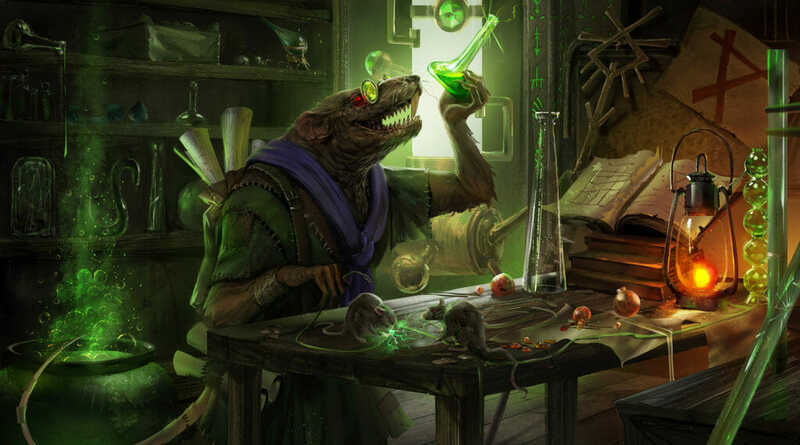 The Laboratory game mode will be available in a free update for Total War: WARHAMMER II on the 14th of December. It will automatically be added into the game in an update on that day, and you can access it from the main menu, under ‘Battles’. 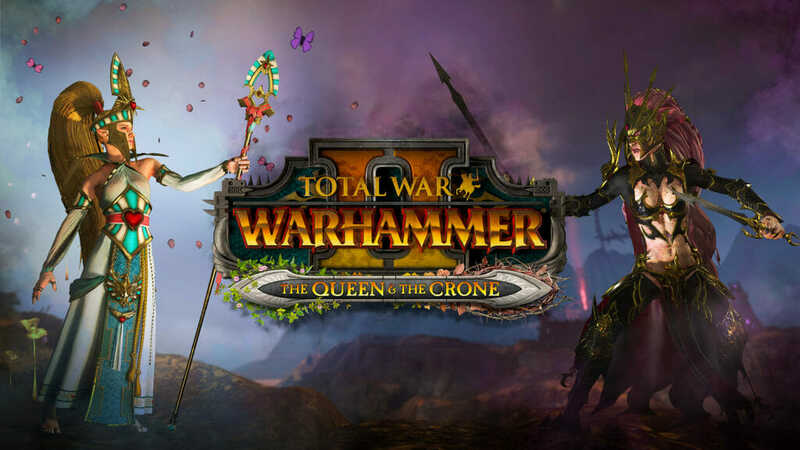 The Laboratory will allow players to tamper with 16 sliders that drastically change the makeup of a traditional Total War battlefield. 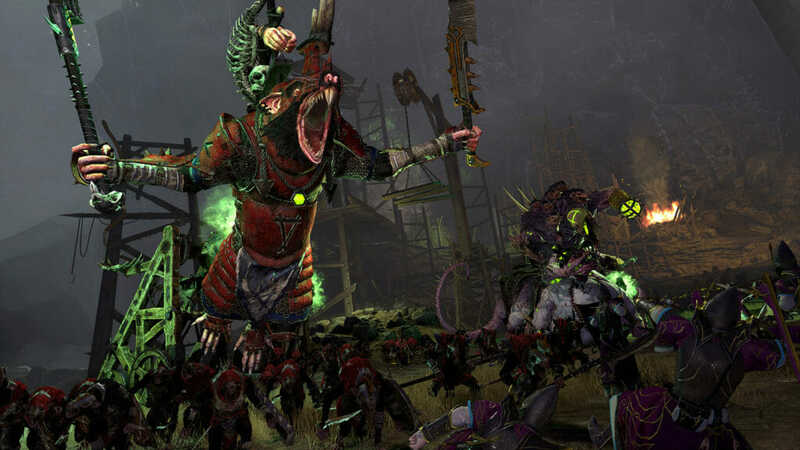 Players can ramp up the unit sizes to have horizon-spanning hordes of clan rats, remove or lower gravity to see enemies fly through the air and increase impact force to see unparalleled destruction amongst your enemies’ ranks. It’s very much a toybox to play with, and subtle changes and combinations of the sliders can produce varied and drastically different results and challenges for you to overcome – or just sit back and enjoy the carnage! Save your preferred Laboratory settings in game, like you would an army set up. The button is located in the bottom left of The Laboratory settings panel. Give it an appropriate name and hit the tick button to accept. Find the ‘Laboratory Settings’ folder and locate the ‘.whl’ file that you saved (It will be the same name as what you typed in step 2). Send your saved Laboratory settings ‘.whl’ file to your friends and enemies. Will The Laboratory run on my PC? 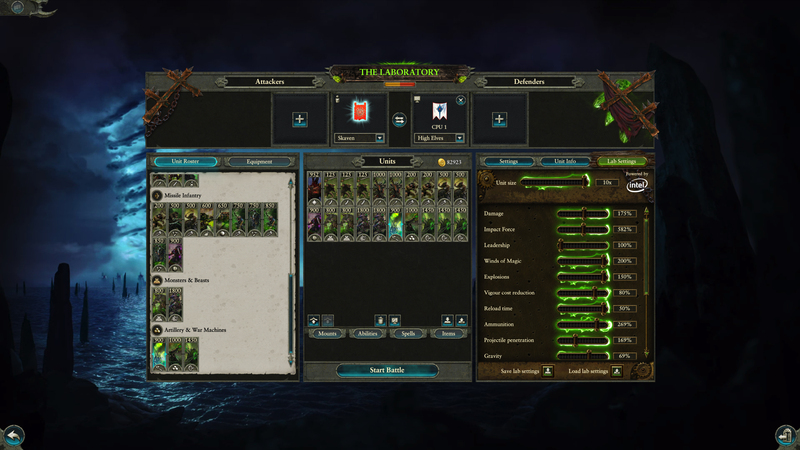 The Laboratory offers a possible glimpse into the future of Total War technology, primarily leveraging Intel’s latest multi-core processors to drive additional performance beyond the original game’s design parameters. Any PC can attempt to use The Laboratory, but your performance will vary wildly so be warned that lower end PCs may massively struggle, or crash, when sliders are pushed to the max. The Laboratory is an experimental test environment outside of the main game and is unsupported. I have mid-range or lower-end PC, is there anything I can do to improve performance in The Laboratory? The slider most likely to effect performance is the Unit Size Scaler, affecting the number of entities in a unit. This is particularly hard on CPUs, though you can increase general frame-rate performance by lowering your graphic settings in the main settings menu e.g. by lowering the resolution you are running the game at, or tuning down your level of anti-aliasing. Do I need an Intel CPU to play The Laboratory? You don’t have to have the latest Intel processor to play The Laboratory, in fact if you were to change none of the settings inside, your PC will be able to run The Laboratory in the exact same quality and frame rate as you would any other battle in Total War: WARHAMMER II. However, when you start to increase the more intensive settings like unit size, that’s when you’ll need a top of the line PC to be able to handle all those entities on screen. It’s amazing! Why don’t you make all battles in the game like this? That would need us to raise the specs for the game to very high levels given the current general level of PC hardware used by players and would also require vast areas of the game to be redesigned and rebalanced to account for the size of units and how they’d interact with each other. 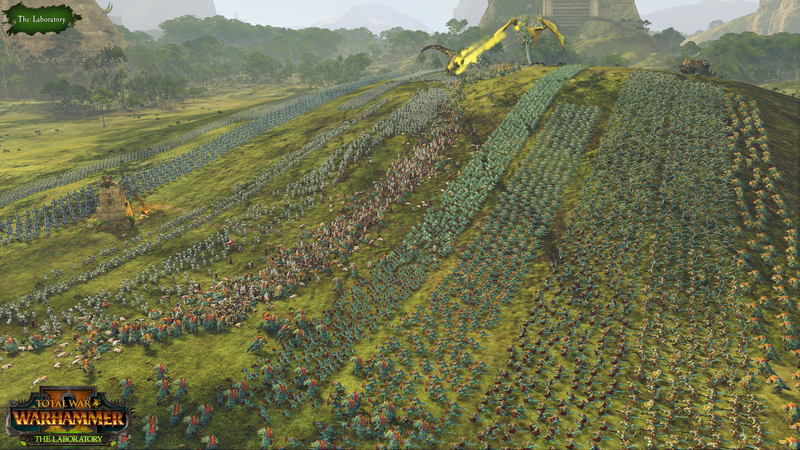 For now, this represents a glimpse into one possible future for Total War; we’d love to hear your feedback and suggestions for more sliders we could add and look forward to seeing what nuts combinations and videos you come up with.